Ever feel you are doing everything correctly to lose weight, yet a month later nothing has changed? Don’t give up hope! Keep refining your efforts. Even the experts don’t agree on what methods work best. “There’s no way to lose weight fast,” says a popular fitness site. But, do a search and you will find they list articles such as “Lose Weight Quickly”, “Lose Weight Super Fast!” and “Lose Fat Super Fast.” I am not dismissing those articles. Some of them contain good advice, but they’re cloaked behind clickbait titles. It is wise advice: beware of articles that are simply a hidden sales tool. Part of the problem is applying weight loss principles to a diverse group. An article for beginners in cycling fitness may urge one to “Go hard.” That may refer to a level of effort that would be considered light to moderate for conditioned cycling athletes. Even when working with personal levels as a percentage of your maximum effort, the numbers may be difficult to pinpoint with accuracy. To illustrate: a beginner’s level that can be maintained for a given length of time may be 50% of his maximum level. Whereas, an experienced, fit cyclist may maintain 85% of his maximum for the same length of time. You can’t always go by numbers. Beginners can’t train the way an experienced cyclist can. Experienced cyclists can train by feel or intuition. They know what they are putting out without looking at the numbers. This does not mean that those numbers are meaningless. Training levels just can’t be defined with precision. You should find your FTP (Zwift Insider has an article What is FTP? and you can read a brief article from Zwift on Understand and Find Your FTP.) This will help you target your efforts more precisely, since training zones are often given as a percentage of your FTP. Some studies and coaches use a percentage of your maximum heart rate. I will link the CDC (Center for Disease Control) information to calculate your Estimated Maximum Heart Rate. Basically, subtract your age from 220 if you are an adult. VO2Max is a level higher than your FTP. It is often expressed for use as a training level in watts. The actual VO2 (Volume of Oxygen Maximum) is expressed in measurements of milliliters of oxygen used in kilograms of body weight per minute. If you can cycle all-out for three to five minutes, that’s perfect. Your wattage in that effort should be the level of your maximum volume of oxygen consumption. Short all-out sprinting uses more energy than the amount of oxygen your body can take in. The four minute test is great for knowing your approximate VO2max level. However, I wouldn’t recommend it for beginners. (I’m sure you’re glad to hear that.) Many athletes simply estimate their VO2Max level to be 120% of their FTP. 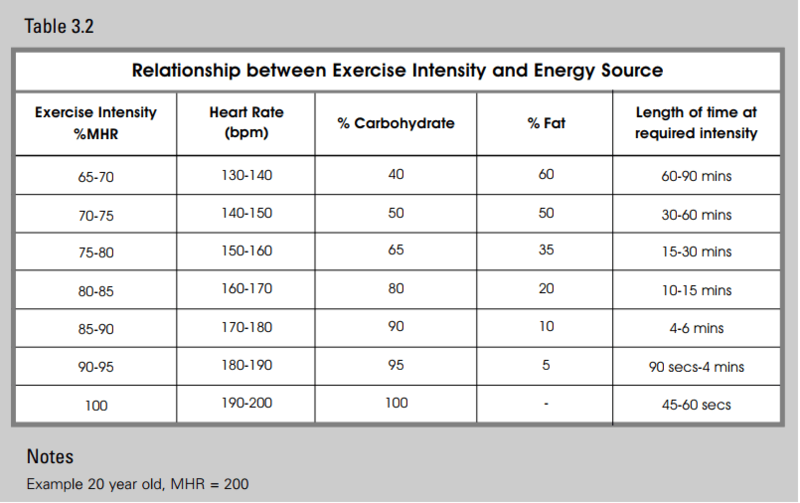 As the chart above shows (results were rounded for simplicity according to author), the best fat burning occurred at 65-75 % of maximum heart rate. This number may not be reliable in individuals with poor heart health, obesity, and other health conditions. It is an estimate. Poor fitness may make one’s heart pump much faster than it would with a trained athlete. A great benefit to low intensity efforts is that they should not over-stress your heart. It should contribute to the habit of daily exercise rather than requiring rest days. Could you possibly be doing too little to get the most benefit? In my opinion, a flat yes. This is why I stress a strength workout of low cadence effort. Low intensity efforts without a high pedal force are quite possibly too low an effort for many individuals. The exception is those whose health limits their ability to do more at present. And this presents the problem with studies of low intensity exercise. It is often defined differently from one test group to another. Let’s examine two individuals doing the same workout. The effort consists of ten minutes 45% ftp, ten minutes 55% ftp, and ten minutes 50% ftp. A little tough to maintain if all you see is a line graph. In example 1, the rider did the exact protocol, averaging fifty percent of his ftp for thirty minutes. His heart rate appears low and under stressed. He averaged a cadence of 90. His heart rate resting was 100. His heart rate averaged 112 for the entire duration. My analysis would be low force on the pedals, essentially just spinning in a small gear. He may lack muscular strength in his legs. This is not a failure, it misses the ideal for weight loss though. This rider may not be targeting weight loss. In example 2, the rider did the test as called for. His resting heart rate was between 85-90. His effort averaged a heart rate between 117-125 beats per minute. This is spot-on to what I would expect. His cadence was between 69-72. He was exerting his muscles much more. It should feel like you are pushing up a hill. Push with your glutes and the back thigh or bicep muscles. The effort of the rider in example 2 burns fat and improves fitness. If you can target the right intensity at the right strength level and add the factor of early morning exercise, you can put yourself in the best position for success. Be aware that fasted exercise is recommended only in the low intensity zone. Many advocates of fasted exercise (pre-breakfast efforts) will limit the total duration of your workout. If you burn 50% of your calories as fat, then you also burn some of the finite amount of glycogen stored in your muscles and liver. You don’t want to completely exhaust your energy by riding over 90 minutes on water alone. If you want a longer ride, take a few calories with you. Experts caution that high intensity exercise (85% ftp and higher) should not be maintained for more than 30-60 minutes without some fuel (sports drink, fruit, cereal). You don’t want an energy crash (aka ‘bonk’) especially if you are riding outdoors. For many of us, it is the opposite problem. I see people ride a short distance to burn 200 calories, eat a 500 calorie granola bar, then pedal off back home! That will blunt your fat burning efforts. Drink water. Drink plenty of it. One more reported benefit of specific fat burning exercise hasn’t been mentioned yet (deliberately so as not to influence you.) If you have tried a ZwiftOff Group Workout on Zwift or have followed some of our workout suggestions; you may have experienced a suppressed appetite following your workout. In sharp contrast, an intense high level workout that burns a large percentage of carbohydrates often causes an increased appetite, aka ‘carb frenzy’. Personally, I thought it sounded like nonsense. Maybe it is the power of suggestion, but I know I get carb crazy after an intense race or workout. I haven’t felt that after the ZwiftOff workouts. All I can say is “Try it.” I wish you all the success you deserve. 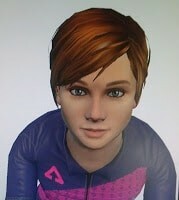 Try our group workout, ‘ZwiftOff with Zee’ Sundays at 7:10 am EST. Check Zwift Events Listing and join us. Everyone is welcome. Biceps femoris muscle is the official name. Bicep refers to two. Interesting article, backed by a couple of references (albeit somewhat old but from respectable sources nonetheless).